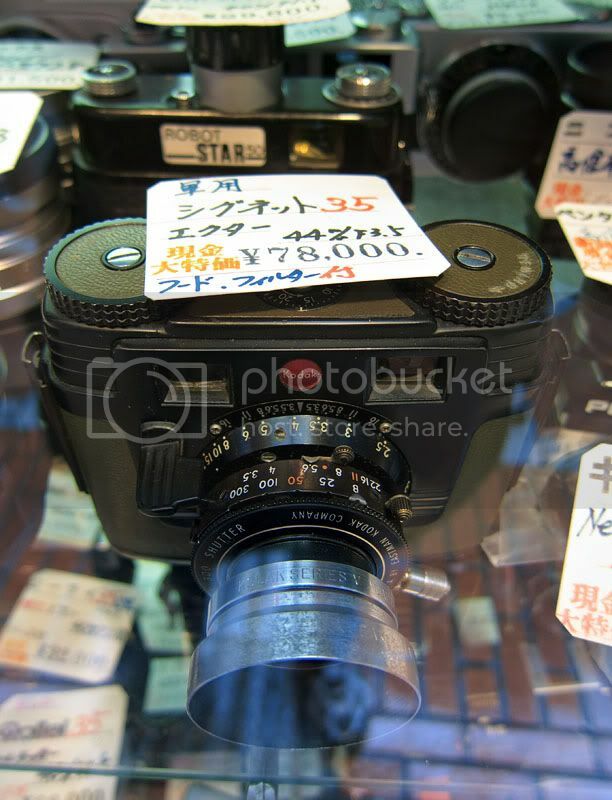 This afternoon I was walking around Shinjuku and was near a tiny, old used camera shop that I have stopped at for the last 20+ years. I have never gone inside, there is hardly room for 2 people to stand inside, but the front window is always filled with used cameras and lenses. Today I saw one I have never seen anywhere before. 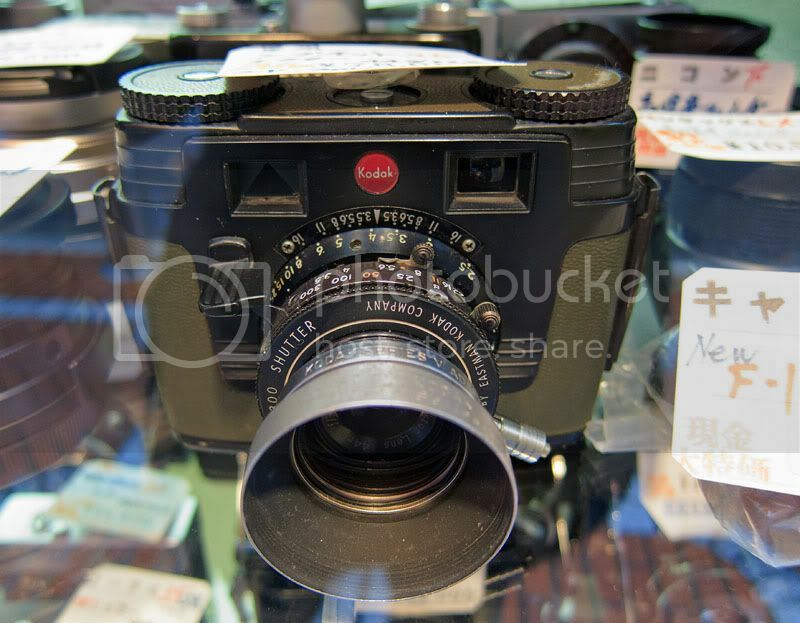 It is a green and black Kodak and the paper sign sitting on top of it says it is a Signet 35 with an Ektar 44mm f3.5 lens. I think years ago somewhere I saw a silver one. It was a cold, rainy day and I was trying to hold my umbrella to keep me and my digicam dry so it was hard to get good photos. Here they are though along with glass reflections. 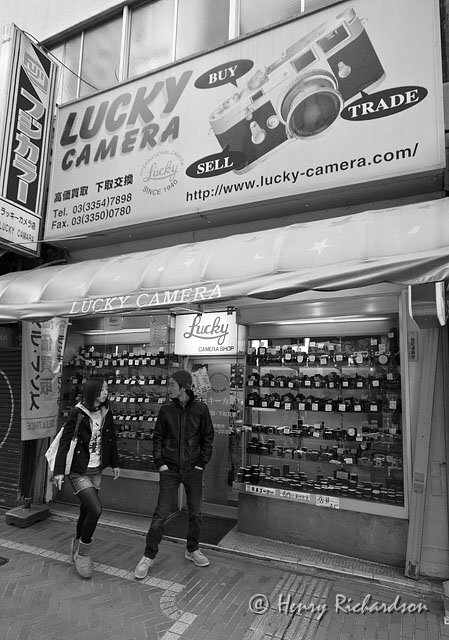 By the way, the number of used camera stores in Tokyo seems to be less than in the '90s. Several of the ones I used to like to go to are gone and the ones that are still around seem to have a bit less stock than in the past. I guess part of the reason is that old digital cameras are probably less desired since the tech changes so fast compared to film cameras. Also, with the internet it is easier for people to sell their own gear, and maybe for a better price, than selling it to second hand shops or trading it in. I think that is still done a lot here, but maybe less than in years past. 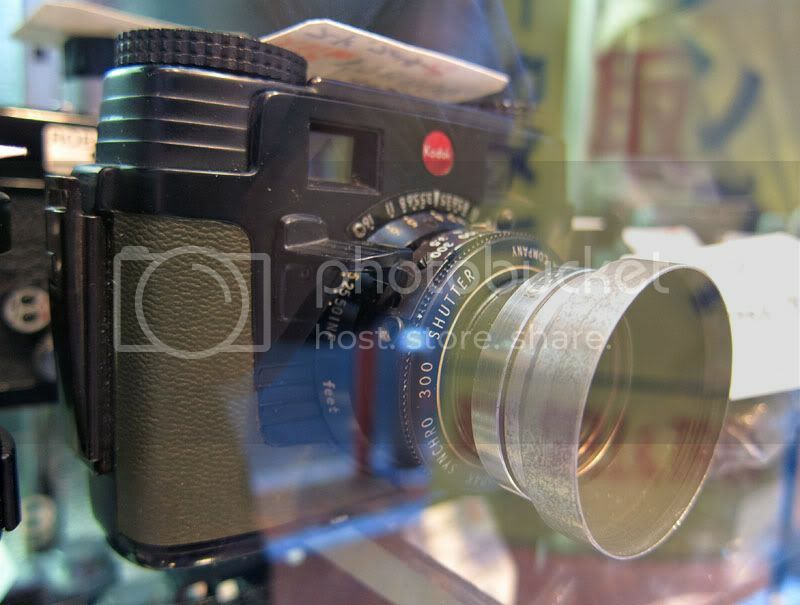 I was around Shinjuku a few days ago and snapped a photo of the little used camera shop where I saw the old Kodak Signet 35. You've got to ask yourself one question: "Do I feel lucky?" Well, do ya, punk?